The grade insignia of an infantry sergeant was three light blue stripes sewn on a dark blue wool background. Light blue is the infantry branch color. 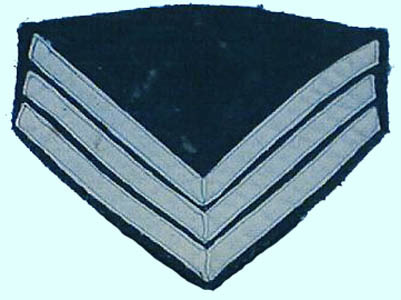 Sergeants were critical to the function of an infantry company, which had four of them in additional to the company's senior sergeant who was called the first sergeant and wore different chevrons. Sergeants were paid 17 dollars a month and in battle were posted behind the line of battle to function as file closers. When a new sergeant was needed they were promoted from among the corporals by the colonel of the regiment on the recommendation of the company's captain.